Hello! 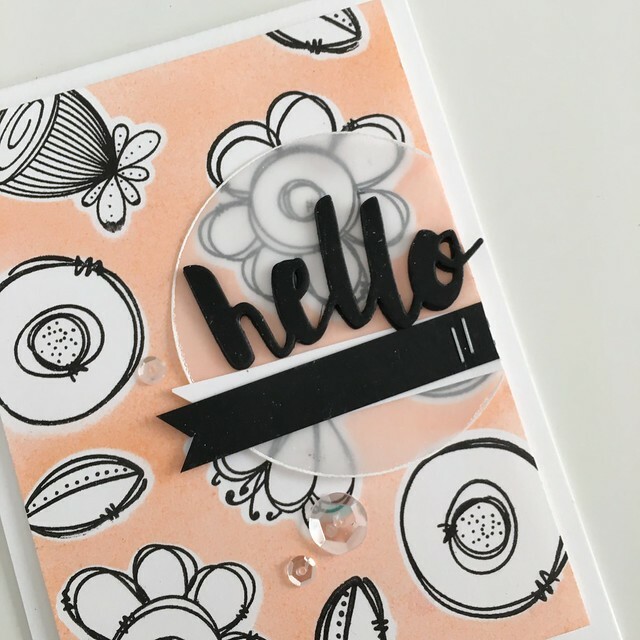 Today I’m sharing a card I made using one of my favorite new techniques – die cut masking. 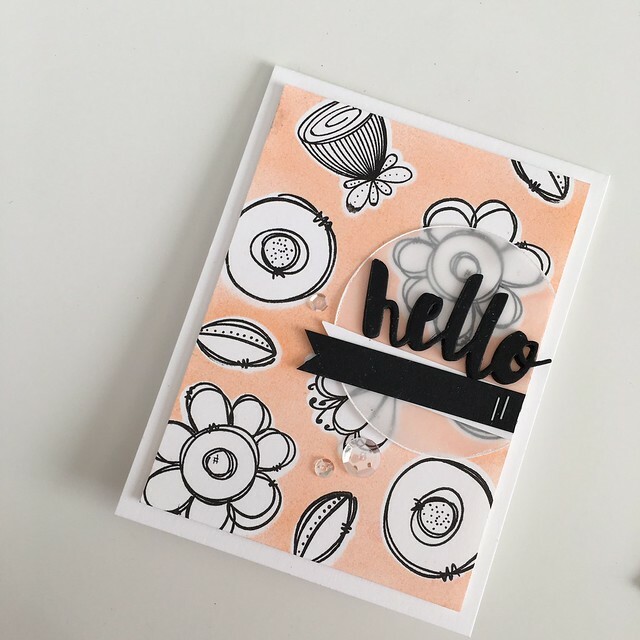 To make the panel for this card, I used the Wplus9 Doodle Buds stamp set to make a pattern on the background. I then used the coordinating dies and inkadinkado masking paper to make masks for each shape. After that, I dusted off my Copic airbrush tools and put them to work. I used my YR02 Copic Marker (light orange) to airbrush the entire panel. After you remove the masks, each stamped image has a nice white boarder around it. I love the effect. This panel sat on the edge of my craft desk for weeks until I figured out what I wanted to do with it…I thought a black sentiment would really pop against the background (the sentiment is the Painted Hello die by SSS). 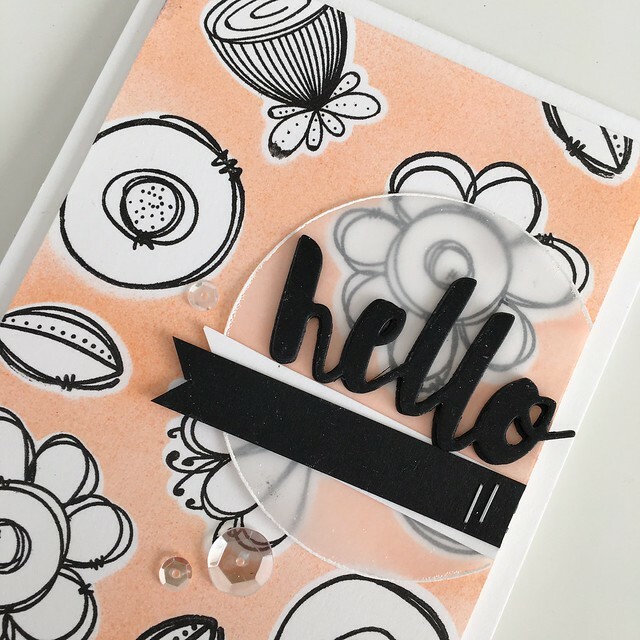 To separate the sentiment from the background a bit, I added a vellum circlebehind the sentiment (I also added a thin line of white embossing powder around the outside of the circle). After mounting the circle and the sentiment, I stapled on some paper strips to ground everything. Lastly, I added some sequins for a little extra embellishment. I’m still trying out different techniques to use with my airbrush, but this is my favorite so far. 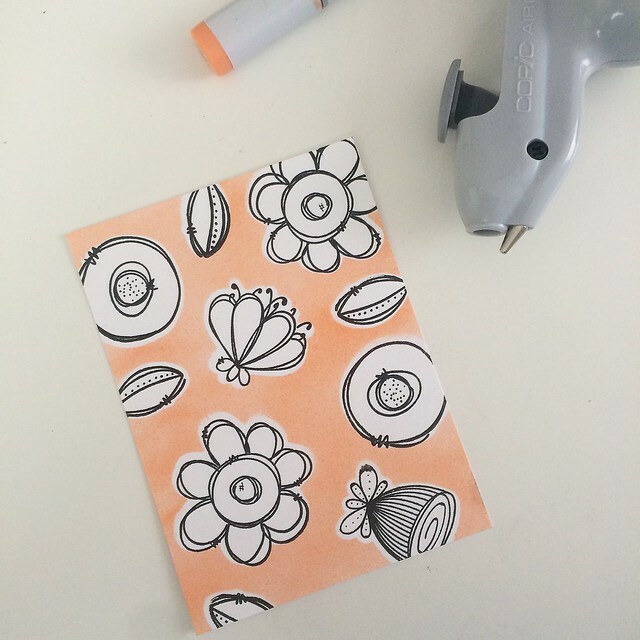 The masking technique also works with ink blending or just coloring marker-to-paper. The best thing about this hobby is that the possibilities are endless!